A lot of visual landmarks (forest, bushes, trees), relative avalanche safety, and northern exposure justify the characterization of this route as the best one to take when visibility conditions are poor (whiteout), there is a high level of avalanche danger, and there is a lack of quality powder. Moreover, this route is remarkable for its views, excellent snow, and virgin forest. This forest is inhabited by brown bears. In the winter, though, there is a good chance that they are sleeping somewhere under the snow and will not disturb you. For this reason, the route is not recommended to be taken in early December and in April. The route begins next to the village of Arakhveti (42.42619, 44.52679) along a small, wide valley, and then passes through open forest areas and the edge of the woods. The best place to stop and rest is an ancient stone cross sculpture at the altitude of 1830 meters (42.41753, 44.51952). The average angle of the slope is 23º. At its steepest point, the angle does not exceed 32°. Despite the fact that the route is pretty easy, it is still rather quiet here. Alternately, a little bit to the west on the same slope, dozens of freeriding tourists visit the Lomisi Monastery daily. Here, there is a high probability that you will be alone, face to face with the wildlife, and you will find untouched snow fields for descent (unless, of course, you meet those who read this guide the day before). However, there is quite a big choice of descent lines. Those who want to combine this route with the one to Lomisi Monastery can do that. In this case, it is optimal to ascend to the monastery following the standard route, then continue with a traverse descent to the east, and a 10-minute exit to the ascent route line to Arakhveti Forest. A combination of these two routes will allow you to get as high as 1 vertical kilometer instead of 750 meters. The total time on the route (taking into account the road to the starting point of the route and the return to the resort) increases from 4 to 6 hours. Safety statistics for the route are good. So far, there have been no cases of avalanche initiation or involvement in them. 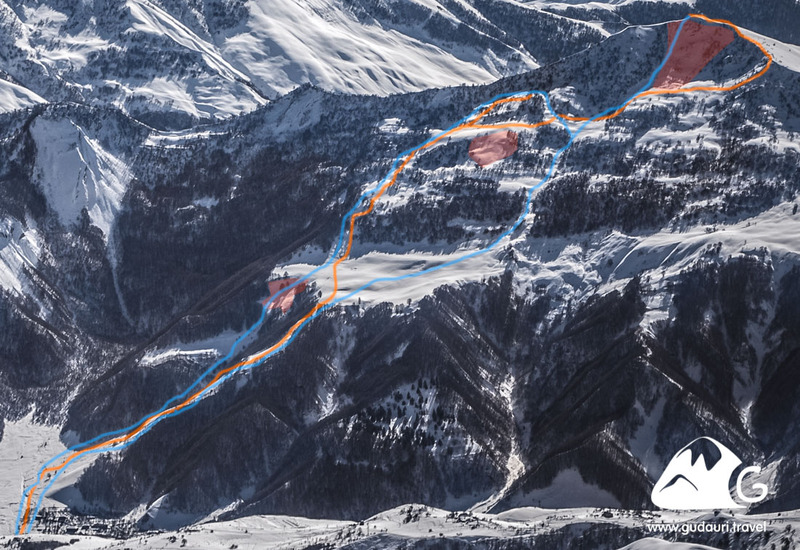 Nevertheless, the absence of incidents on this slope should be attributed to the fact that this route is still rarely taken by freeriders, as it is not well-known. Despite the fact that the relief is quite safe here, there are several places where avalanches happen (marked in red on the map). Driving from Gudauri to the beginning of the route (Arakhveti) takes about 20 minutes. If you do not travel by car, then the most convenient option is a taxi. A taxi from Gudauri to the beginning of the route and the return to the Gudauri Resort after you’re done will cost from 70 to 100 GEL for a 7-seat car. Taxis can be found at Smart Supermarket or ordered at the reception desk of your hotel. You can also get to the beginning of the route by public transport. Gudauri-Tbilisi minibuses leave from Smart Supermarket every hour to hour and a half. If you pay the full cost of the trip to Tbilisi (7 lari per person), and if the driver has enough space for your skis and backpack, he will take you to the village of Arakhveti where the route begins. The return by minibus is less predictable, since it almost always returns filled to capacity from Tbilisi and therefore, can’t take you. The last minibus from Tbilisi to Gudauri passes Arakhveti at about 18:25. The route begins in the village of Arakhveti (42.42619, 44.52679), to the right of a free-standing two-story roadside cafe at the broad mouth of a stream between yards. It runs 300 meters along a small, wide valley, then rises along the right open slope and comes closer to the right border of the forest. An hour and a half later, at the exit from the lower forest, there will be a large stone cross sculpture at a big tree that’s been struck by lightning. This is a good place to rest and choose the upcoming ascent and descent lines. When planning lines, take into account the traces of previous freeriders; the whole slope is well-viewed from here. Till this point there are many descent options. The rest of the descent can be completed following the path that led you up, or take an interesting direction to the nearby couloir (see on the map). Confident skiing. Backcountry experience at least one year.